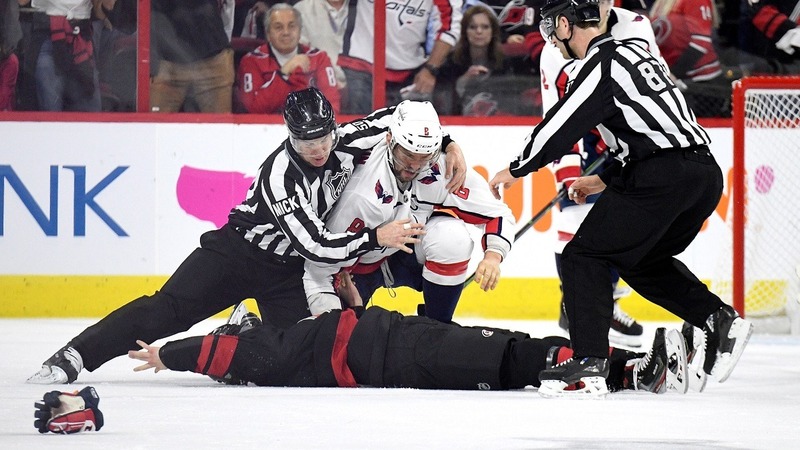 The NHL’s top scorer, Alex Ovechkin from the Washington Capitals, knocked out 19-year old Andrei Svechnikov from the Carolina Hurricanes during a fight in Game 3 of an opening-round game in the NHL Eastern Conference Playoffs. You do not see many hockey fights in the postseason, especially this early into the first set of series. On Sunday night, the Las Vegas Knights and San Jose Sharks game ended with a heavyweight fight. Ryan Reaves and Evander Kane dropped the gloves amidst a flurry of haymakers. The Washington Capitals are the defending Stanley Cup champions. They took a 2-0 lead over the Carolina Hurricanes heading into Game 3. The Hurricanes defended their home turf with their first home playoff win in over a decade. The Canes won 5-1. They now trail 2-1 in the best-of-seven series. The Canes won the game, but they lost two key players due to injuries. They lost Andrei Svechnikov midway through the first period after he was knocked out by Ovechkin in a fight. The team was forced to play three shifts of forwards for most of the game after Michael Ferland injured himself less than two minutes into the game. Despite being shorthanded, the Canes won the game and trimmed their series deficit to one game. As a rookie with the Carolina Hurricanes, Svechnikov scored 20 goals with 17 assists. In his first playoff series, he scored two goals in a Game 1 loss to the Caps. He assisted on a goal in Game 2. He came into Game 3 looking to make a distance, but he underestimated Alex Ovechkin. The 33-year old veteran made his fellow Russian pay for his willingness to fight in the playoffs. At 9:07 remaining in the first period, Ovechkin slashed Svechnikov, who quickly wanted to go. Ovechkin could not get his gloves off fast enough. Svechnikov might have landed the first blow, but Ovechkin unleashed three consecutive powerful right punches. The third landed while Svechnikov slipped backwards. Svechnikov hit his head on the ice and was rendered unconscious. The announcer immediately called out for the medical staff and trainer. The Hurricanes were furious about the fight, even though Svechnikov instigated it. The Las Vegas Golden Knights are fighting their way back to the Stanley Cup Finals. They took a 2-1 series lead against the San Jose Shakrs with a 6-3 victory on Sunday night. The game featured an unexpected heavyweight fight between Vegas brawler Ryan Reaves and San Jose’s Evander Kane. Everyone around the league knows Reaves is one of the top fighters, but Kane didn’t back down. After a physical series, the two decided to square off late in game 3. With game locked up for the Knights, Reaves and Kane dropped the gloves with two minutes remaining in the third period. The two exchanged multiple haymakers. They were thrown and absorbed with impunity. The music supervisor at T-Mobile Arena in Vegas trolled Kane by playing a remix of the children’s son “Baby Shark” moments after the fight ended.